One of my very favorite things is circling up with like-minded women to share and create together. For about five years I had the pleasure of doing just that, guiding women’s creative wisdom circles and being a part of a unique sisterhood. But, life intervenes sometimes. You know how that goes. And I had to put the women’s group on the back burner when we sold our Sacramento home and relocated (life and business) to Santa Rosa. This group focuses on reflective/expressive writing. I’ve been developing a reflective writing practice of my own and taking classes at the Therapeutic Writing Institute during the past few years, and I’m super excited to share the process, approaches and techniques with you. There’s double goodness here too: while the practice of expressive writing can be replenishing and renewing itself, our writing topics will creatively shine a light on each woman’s unique challenges and gifts related to her own self-nurturing and self-renewal as well. We gather about eight times a year, either in person my Santa Rosa office or through a live virtual teleconference. It’s a free group that runs through Meetup. So you will need to join both Meetup and my online community if you’re interested in participating. I’m doing this because just about every woman I know yearns to connect with other women in a deeper way. During the past 17 years I’ve spent countless hours teaching, training, facilitating and leading groups. But that’s not why I created that first women’s wisdom circle back in 2011. I created it because I knew there were women out there who needed it just as much as I did. And I think that is still very much the case. Perhaps more so, even. So if you’re in Sonoma County I hope you’ll join me. 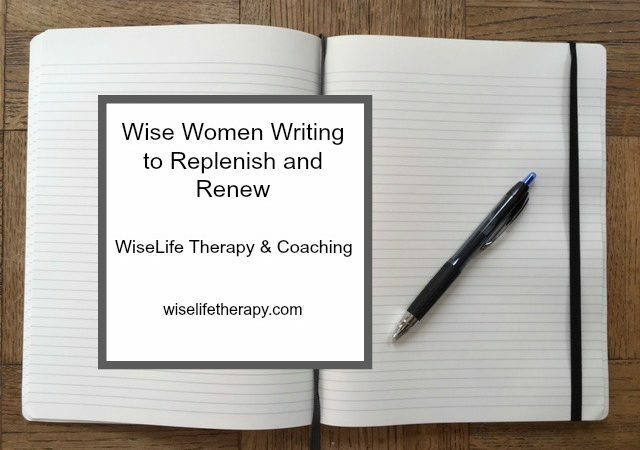 Here’s the link to join the women’s group on Meetup: Wise Women Writing to Replenish and Renew. Here’s the link to join my online community: WiseLife Therapy and Coaching. Looking forward to writing and circling up with you, one way or another! In writing, we see, sometimes with fear and trembling, who we have been, who we really are, and we glimpse now and then who we might become. December 2018 UPDATE: During the past 16 months our group has grown to over 200 women!